Which face is indicative of a healthier chow? My boyfriend and I have just put a deposit down on a chow chow puppy but I wanted to know which type of chow face is indicative of a potentially healthier chow? Is it the adorable squished, wrinkly face that I've seen in photos & loved, or the more pointed nose/snout? I am asking because both chow parents of the puppy we will be getting have a more pointed snout rather than a squished face and I would like to know if this is the sign of a good, healthy chow or not. I think both are adorable but I just want to know if there is a difference between the two as far as breathing, entropin, etc. To some extent it is the luck of the draw once you have ruled out if parents have health problems but if you did a numbers poll I would imagine squishier have more problems. But you still get entropien in open faces. One of my friends with a beautifully open faced pretty girl has just had to have both her girls' eyes done at the age of 14 months. There are no guarantees unfortunately. Have you checked out the parents to see if they have tear stained faces? Sirchow wrote: To some extent it is the luck of the draw once you have ruled out if parents have health problems but if you did a numbers poll I would imagine squishier have more problems. But you still get entropien in open faces. One of my friends with a beautifully open faced pretty girl has just had to have both her girls' eyes done at the age of 14 months. There are no guarantees unfortunately. Thank you so much! It's so wonderful to have a site like this to talk with other chow owners. I did go back & look at the photo of our future puppy's dad and he has pretty bad tear stains. 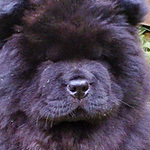 The mother is a black chow so I'm not sure if she has tear stains as well but I've attached the photo of his dad. Does he look like he may have eye issues? Thank you again for all of your great advice. You all are awesome! I am a fan of the open face, but then that is just me. Both types are beyond beautiful. Eyes are just one aspect of the dog. Look at both the parents, and find out as much information as you can about their health. 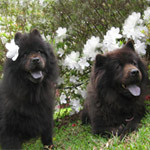 Chows have a number of skeletal problems, especially with their elbows and hips. My little girl Ursa has thyroid and allergies which are an issue for her. I can see the tear stains in the photo, but it is hard to tell if that is really an issue. Going purely by the photo I would say that there is some problem but that could just as easily be seasonal hay fever. As his face is not badly stained...and I have seen creams far worse affected than this I would say it is not a bad problem....but....entropien is in the chow breed and sometimes comes out of no where. Genetics are not simply a case of the parents' health. Talk to the breeder and ask if you might have their permission to talk to their vet. An acquaintance in the chow world recently had a smooth pop up in a litter where close examination found the last smooth on the mothers side ten generations back and none could be found on the fathers though it had to be there. A smooth puppy has to have the gene from both sides. I am only telling you this to show you that there are no guarantees in buying a puppy. You can only do your homework, do your best and then the best anyone can do is to insure their puppy and commit to looking after and loving them what ever comes along. Ursa's daddy wrote: I am a fan of the open face, but then that is just me. Both types are beyond beautiful. Eyes are just one aspect of the dog. Look at both the parents, and find out as much information as you can about their health. Chows have a number of skeletal problems, especially with their elbows and hips. My little girl Ursa has thyroid and allergies which are an issue for her. I can see the tear stains in the photo, but it is hard to tell if that is really an issue. Thank you very much for your feedback. We have decided to go with a different breeder as the old one did not do health certifications nor were they able to provide much information about the parents to us. Better safe than sorry we feel. Sirchow wrote: Going purely by the photo I would say that there is some problem but that could just as easily be seasonal hay fever. As his face is not badly stained...and I have seen creams far worse affected than this I would say it is not a bad problem....but....entropien is in the chow breed and sometimes comes out of no where. Genetics are not simply a case of the parents' health. Talk to the breeder and ask if you might have their permission to talk to their vet. Thank you so much for your insight. We understand that with any living being there are health risks but we have decided to go with a different breeder now. The former breeder who owns the dog photographed above does not do health certifications nor were they able to offer much insight into the parents. We've found a wonderful new breeder who we feel extremely confident in. Although that has delayed our getting the puppy, I will be SURE to post photos when he does arrive this summer!